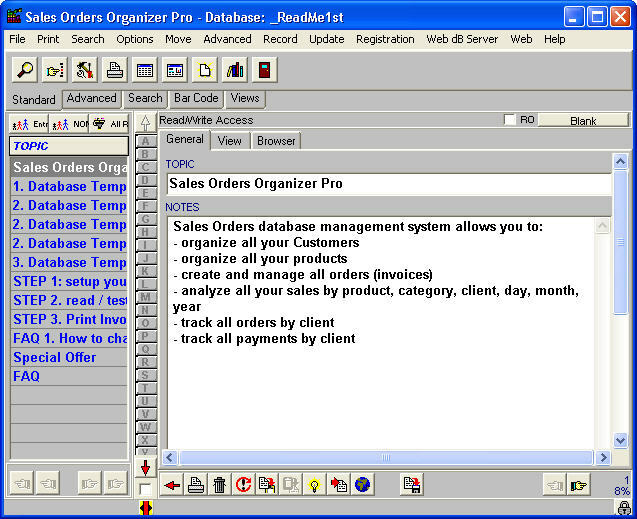 Sales Orders Organizer Pro Sales Orders management system for Windows. A simple sale orders processing system for small businesses. Our sales orders management solution will help you with following activities in your business: Easily manage and track your customer data. Organize your product inventories. Process sales orders, track quotes and shipments. Produce invoices, mailing labels, shipping lists, summary reports. Process and track payments. Simple, easy-to-use: Ready-to-use database templates and the user-friendly interface let you easily and quickly manage your customers, organize products and services, and process sales orders..
Quickly access your data: You can access and view your databases in virtually any way: table viewer, form viewer integrated with the list view, browser viewer, .. Learn once use multiple times: You can use application for all your sales orders database needs. There is no limit on the number of databases or records that you would like to use in our database system. Designer allows you to modify our database templates or expand your system with solutions that you are going to create. Network supported: you can use our sales orders processing software on a single computer or on the network of computers (multi-user license required). Instant Sales Tracker - A reliable and feature-packed database designed to help your business easily. Customer Invoicing - an invoice template that comes with the ability to store invoices, products and customers and perform advanced invoice sales reporting. Simply Invoice Software - Invoicing, Quoting, Stock Control and Contact Management software.